This month I’ll show you the method for creating outlines and cut paths for projects that have patterns that overhang the main body of the design layout. 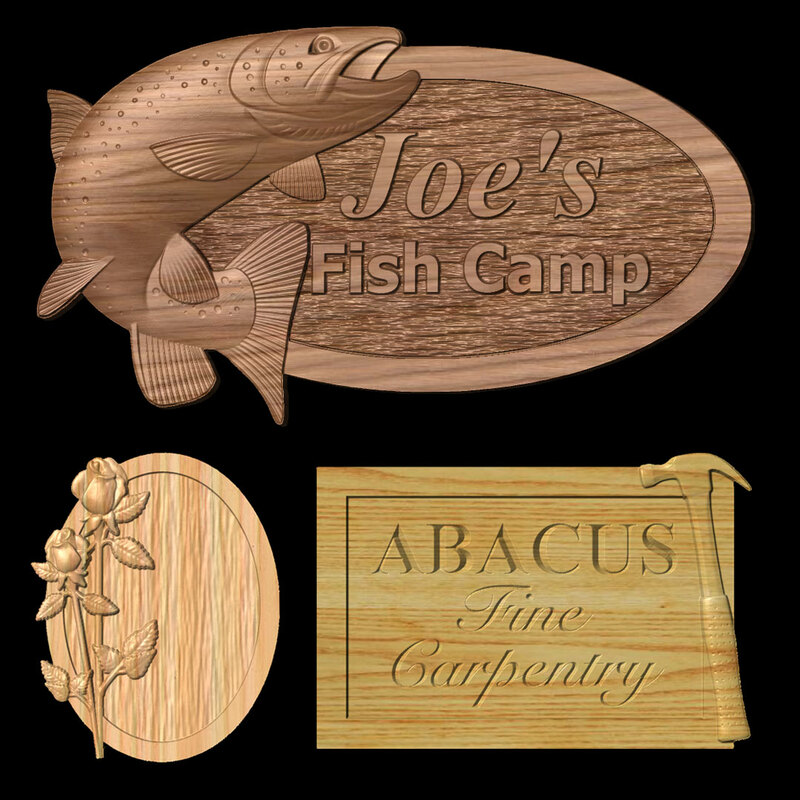 I have received many “How did you do that?” inquiries on the subject, so I decided to write up a tutorial about it using a Fish Camp sign as an example. ￼These are all examples of projects with “overhanging patterns” with auto-generated outlines for a cut path. If you’d like to follow along this tutorial to learn, create a new project with the following settings. 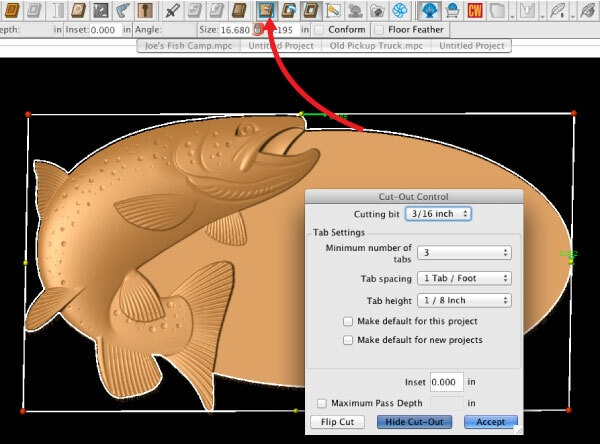 I downloaded the brown trout pattern from the CarveWright Pattern Depot and placed it on my the left side of my project board. Resize the pattern to fit on the board and change the depth to a more reasonable .300″. Using the “Oval Tool”, draw the shape of your sign on the board making sure to overlap the pattern. Then, with the oval still selected, click the“ Carve Region Tool”. 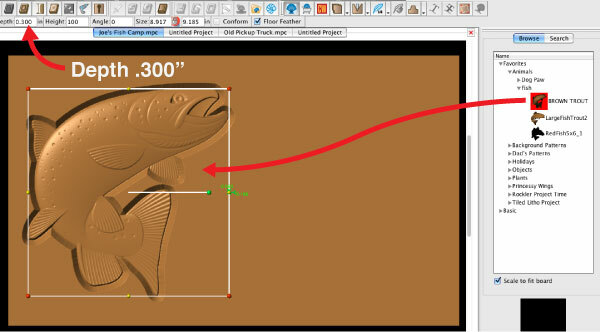 The default depth of the region is 0.25” but I changed it to 0.300” to match the depth of the trout pattern. Scale and arrange the two elements together as necessary to achieve the desired balance. 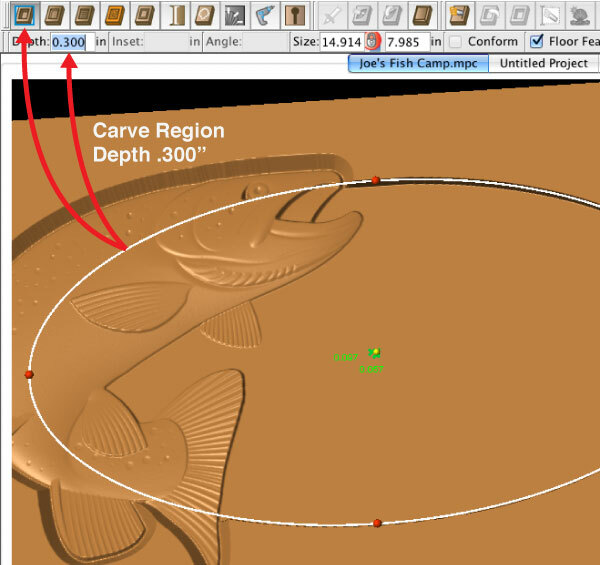 Use the “Carve Region” tool to set the oval to a .300″ Depth. 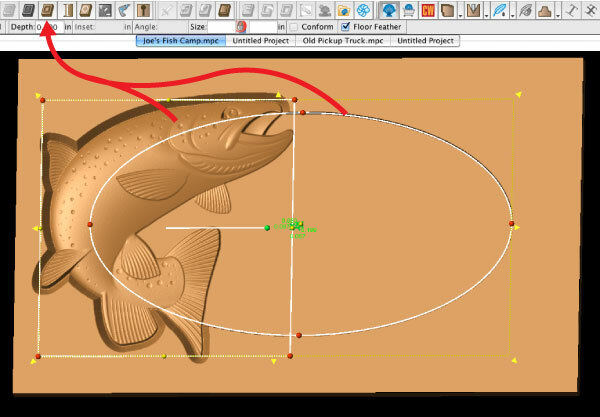 Now that the layout is complete for the fish and oval, we can have Designer create the perimeter outline for us automatically. 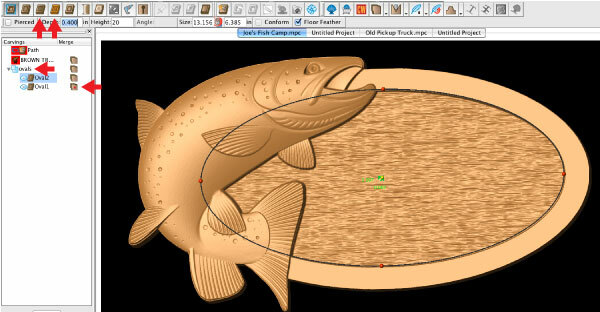 Select both the oval and fish patterns, then click once on the “Outline Tool”. The outline now appears around the entire perimeter of selection. 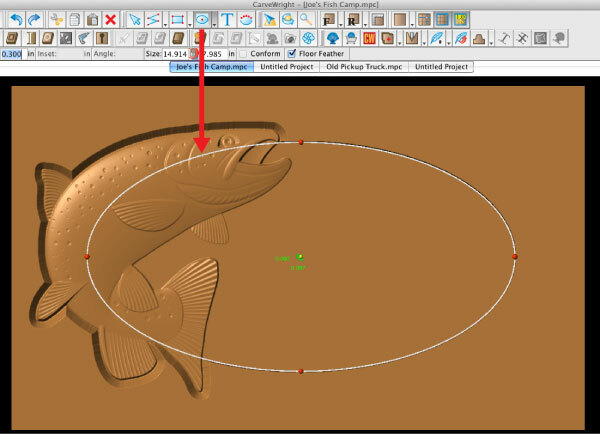 Select both the fish and the oval region and click the “Outline Tool”. With that new outline selected, click on the “Cut Path Tool”. This opens the Cut-Out Control panel where you can choose all the settings for your cutout. First, choose the Cutting bit. It defaults at “1/8 inch”, but you can change it depending on the material. Next, you can set the automatic Tab Settings. I never change these settings from the default unless it is a very delicate piece and I want to add more tabs. You can change to the Inset to specify how far the bit is spaced from your outline, but this is usually going to be left at default. Then, there is the Maximum Pass Depth setting. This can be a controversial setting. Some users will always leave it at the default setting of making a full depth cut in one pass, while others set it up to make smaller cuts, such as .25″, to do multiple cutting passes. It’s been my experience, choosing the right bit for the material is more likely to be the biggest factor in avoiding bits breaking. If you are cutting harder material, such as oak or other hardwoods, it is recommended to use the “3/16 inch” cutting bit. Choose the setting you are most comfortable with. Lastly, we will select “Flip Cut” to move the cut path to the outside of the line, choose “Hide Cut-Out” to show what the finished piece will look like, and “Accept Changes” to close out the control panel. Use the “Cut-Path” tool to cut the overhang sign shape out. Your overhang outline is made. Now, go ahead and finish out the design. Add a second smaller oval and use the “Select Texture” or “Select Material” (Designer PRO) tools to create a background texture. Then, we’ll use the merge techniques we learned in last month’s Tips and Tricks. Place both ovals in a group folder, make the larger oval additive, and then change the depth of the smaller oval to be deeper than the larger. I set the inner oval to .400″. This creates a nice framing edge. Then add whatever text you want to the sign. You will probably need to reduce the height settings of your texture make it more subtle. Add a recessed area with a texture to create a dynamic looking sign. Before uploading, be sure to run through your “optimization” steps. Set Bit Optimization: Best on your carvings. Set at least a small “Draft” on your text to prevent chip-out, and use feathers where needed. Brush up on Project Optimization here. I hope this Tips and Tricks article was helpful, find more of these and other great tutorials on the searchable CarveWright Support site.